One of the big mysteries I found as I was trying to learn how to “safely” exercise with diabetes was trying to figure out when I was supposed to cut my basal rate, when I should eat, when I should bolus insulin, and when I should not through my glucometer across the room. 😉 Seriously, trying to figure out how to plan your sugar and fuelling strategies can be one of the hardest things to figure out when exercising. Until you get it dialled in it can truly feel like you are always low and eating more than you burned just to stay alive. But take heart, you’ll figure it out eventually! The key to figuring it all out is, of course, test your blood sugar and test often. Eventually it gets less onerous as you figure it out. Finally, it probably goes without saying, but CGMS is a knight in shining armour when trying to learn how exercise affects your glucose levels. When exercising, your body has a few fuel sources it can work with – fat, carbohydrates and protein. As your exertion level increases, the mix of fuel changes. Generally speaking, the amount of protein burned is negligible, so we won’t worry about that – you probably have more than enough. That leaves fat and carbohydrates to worry about. Our bodies store more than enough fat to provide fuel if that is the chosen source, so that leaves us with carbohydrates. Our muscles store glycogen which provides roughly enough energy for our muscles to perform for ~1 hour. After that, normal people risk “bonking”; we risk much worse. So, long story short – you need to eat carbohydrates when you exercise vigorously enough. Recovery – easy, not very strenuous, you could go at this pace for ages. This is where most of us start – this is a primarily fat burning zone. For me, blood sugar doesn’t do much in this zone if it’s an activity my body is used to. Aerobic – this is a zone where you start “building”; fuel is generally fat in this zone as well. It’s a great training zone to work on your “aerobic base”, and also great for active recovery for athletes in training. It’s a great zone for weight loss too. Zone 1 and 2 kinda blend together for me. My blood sugar is pretty level in this zone due to the high fat burning percentage. Tempo – this is where the rubber starts to hit the road. This is when I start to notice a noticeable impact on blood sugar. In this zone you start to move towards some anaerobic fuel sources – carbohydrates. You start to produce lactate at this point, although your body is still able to funnel most, if not all, of it away. This zone is sustainable – I won’t say it’s easy every time, but it’s sustainable. 🙂 Most of my runs end up in tempo and my bike rides end up averaging at about tempo levels (with some zone 4 and 5 in there too). If I know I’ll be in tempo for a while, I’ll start to plan a fuelling strategy; if it’s under an hour, then I may not fuel for it (depending on my starting blood glucose; I’ve gotten comfortable with this around a 5.0). If I do fuel for under an hour, I dose about half the bolus for it. If it’s over an hour, then I start to plan out a fuel strategy – 30-45g carbohydrates every 45-60 minutes with ~50% (or less) insulin bolus, depending, to ensure I have insulin to help the glucose get out of the blood and into the tissues that need it. If it’s >2 hours, I reduce my basal insulin. Anerobic – This is probably a misnomer, as you aren’t actually at the anaerobic threshold, but let’s not argue semantics since we can’t even agree on what to call the zones. What we can agree on is that zone 4 uses very little fat – you’re pretty much relying on carbohydrates. This is when you’ll start seeing blood glucose drop without proper fueling. Zone 4 is a great zone to train in to help build your lactate threshold (or anaerobic threshold, or any other name for it), but it’s not very comfortable. The perceived effort of this zone is pretty high; but you’ll still have a bit of room to “drop the hammer” and go into zone 5 if you have to. This is probably more of a race pace. If you plan to be in this zone you had better plan your carbohydrates accordingly. For me, it’s probably closer to 45g of carbohydrates every 45-60 minutes, with less bolusing. Speed/Power – Owww. This is simply not sustainable. You are burning carbs in the form of gylocgen. Nothing else. You better have some glucose on board and some glycogen left in your muscles or you will crash! This is a zone for speed and power training. EDIT: This is where my diabetes may vary – some diabetics, especially some Type 1’s, find this (and zone 4) may cause their blood sugar to temporarily spike. Typically, this zone is hit in power lifting or high intensity interval (HIIT) training. For me, I rarely have this reaction when doing HIIT, but during a race scenario I may have a post race spike. Ginger Viera’s book, “Your Diabetes Science Experiment” discusses this. The best advice I can give is test often, learn what your body does, and adjust accordingly. There’s lots of sources debating what the zones are (see Wahoo, Fitscript, Competitor) but generally, the more anerobic your workout becomes, the more you need to take in more carboyhydrates to match what you are burning. As you shift from zone 1 to 5 you drastically increase the percentage of carboyhydrates your body is using to fuel your performance. So say I am going for an easy, leisurely bike ride. I know from lots of HR monitoring that this will generally put me at ~100 bpm and my LTHR is ~160, so I know that this will be a mostly recovery level effort, and my body will mostly burn fat. So I don’t generally eat extra for this. However, if I am going for a 2-3 hour bike ride at tempo levels with some zone 4 and 5 work peppered in there, well, then I will adopt a strategy of 30g-45g of carboyhydrates every 45-60 minutes or so (a split between solids and liquids, temperature dependant). When fueling, eat real food! Homemade rice cakes, yum! To illustrate, here’s two overlays I’ve created of my CGMS output and heart rate monitor. The first is from a 2 hour, mostly zone 3-4 bike ride. I started the ride high because I was delayed getting out the door – my tire bead wasn’t holding, so I was pinch flatting my tires. I had bolused 50:50 combo bolus, so I started a bit high. As you can see, my fuel source was mostly carbohydrates for the first part of the ride, and my blood sugar reacted accordingly. I ate some to slow the decline. I knew I was halfway finished with some hills coming up, so I only bolused 50% of the carbohydrates. I ended the ride right where I wanted to, at 4.0 (and the trend stopped once I stopped). My second example is from a run I had at lunch yesterday. It was my best 10k yet! 41:35! I had a bit of insulin active in my system, but I knew I’d be less than an hour so I did not fuel. I started just above 6.5 and I knew I’d be running hard but I also know how my body reacts and that I had enough of a buffer. Of course I ran with sugar pills in hand, but I knew after my training that I would not need them for this effort. 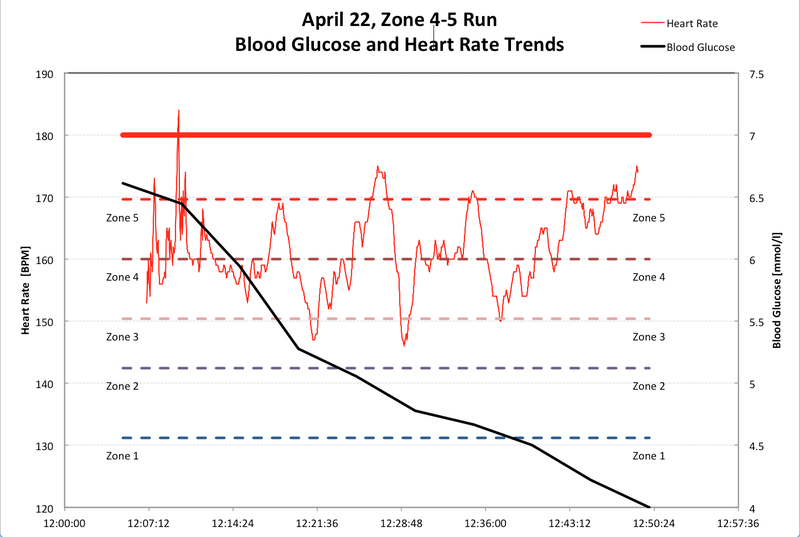 You can see that zone 4-5 really drive carbohydrates (glycogen) as a fuel source – my blood sugar started to decline about 5 minutes into the run. 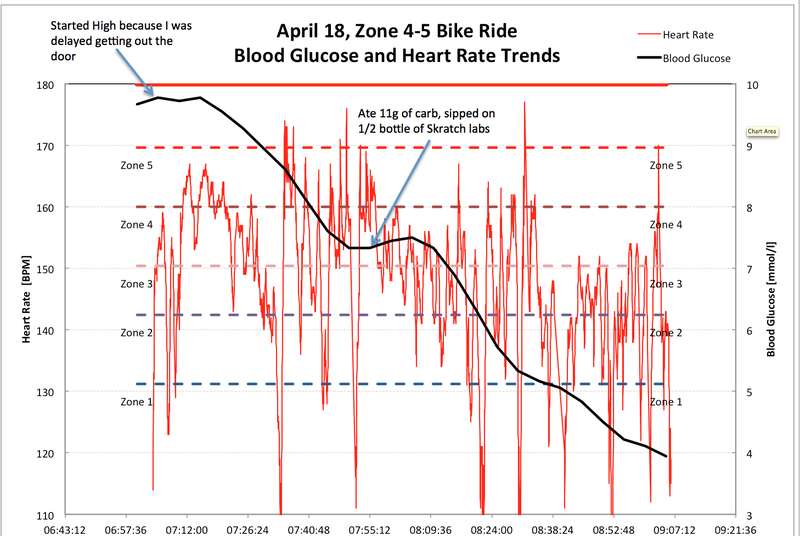 I’ll try and add a HRM vs. CGMS post for Zone 1 and 2 to show the difference, but I hope this helps you see the impact of heart rate and blood glucose. Until then, what’s the morale of the story. Test before, test during and test after exercise. Test a lot. If you have a CGMS, use it. When you first start out, stop and test. Anytime you think you should, stop and test. You will figure it out, and you will get more confident in what to expect. It’s not a perfect 1:1 ratio, but knowing how your body performs aerobically will help you understand how to fuel for performance. Eventually it becomes second nature, and you’ll be comfortable with exercise and blood sugar management. It gets better, it just takes a bit of work. And as always, your diabetes may vary!